LLoyd Queen is a Professor of Remote Sensing in the Department of Forest Management at the University of Montana. He teaches courses, workshops, and field camps in remote sensing, GIS, and fire management. His research focuses on assessments of landscape dynamics at regional scales. Current sponsored research includes estimation of forest fuels using LIDAR and optical image data, characterization of forest stand dynamics and change monitoring, and burn severity assessments. 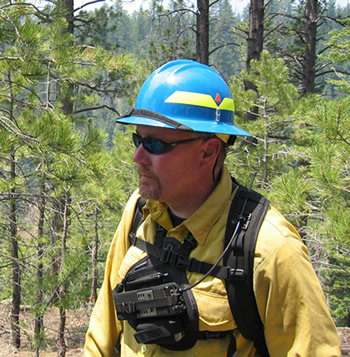 Since May 2000, he has served as the Director of the National Center for Landscape Fire Analysis. He received his Ph.D. degree from the University of Nebraska, and worked as a post-doctoral scientist at the University of Minnesota before coming to the University of Montana in 1995. He has twice been awarded a NASA Research Fellowship; served as the Presidential Research Fellow for two years at the University of Nebraska, and is past Chapter President of the American Society for Photogrammetry and Remote Sensing. He is active in several national and state-based initiatives in the adoption and diffusion of information technology for natural resource assessment and monitoring.